Mexico: 1931. Across the Rio Grande from Texas lies Corazon de la Fuente, a small pueblo that is still ravaged from years of warfare, revolutionary governments and the ensuing crippling poverty. In strides Dr. Romulus Brinkley, who promises salvation and a much-needed cash injection to the town if they’ll let him build an incredibly high-powered radio transmitter. The eponymous tower is mostly a marketing gimmick for the good doctor’s erectile dysfunction clinic across the border, which promises to give men the lustfulness of a horny goat. Otherwise, the airtime is filled with cornpone farmer reports, Evangelical rants, South American mysticism and down-home spiritual songs, the most mentioned of which is “Will The Circle Be Unbroken”. This was a fantastic novel, a kind of mix of The Sisters Brothers‘ nouveau western narrative with the cast of characters of something like The Bridge of San Luis Rey. I really enjoyed reading about every different person’s viewpoint, as the story reaches across all social strata in the town and gives you a good sense of what this period in Mexican history might have felt like for its inhabitants. You can tell you’re in the hands of a great novelist when every time a character’s chapter ends, you immediately wish you could get more of that person, but then the next chapter does the same for that person, and so on. It’s something this book has in common with the Song of Ice and Fire series, or a book I read very recently, Toby Barlow’s Babayaga. 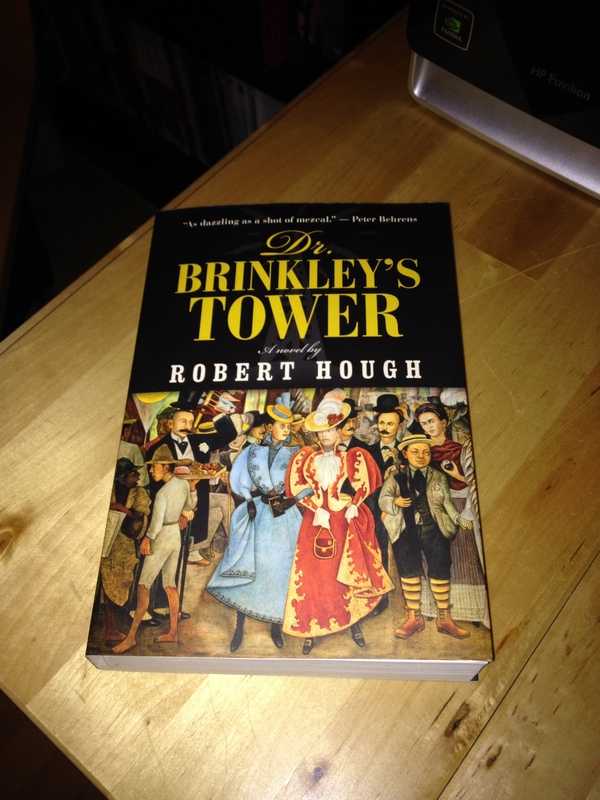 I have to admit my favourite character was probably the larger-than-life Brinkley, with his mansion and fine clothes, perfectly picked for each occasion. I also really liked the molinero, the town’s former miller/baker, who is a charismatic Casanova-type, nearing the end of his life and contemplating the women he’s loved over the decades. Hough also does a great job at evoking the milieu of Mexico at this time, the sights, the flavours and the smells. He really helps you to understand the citizens’ different circumstances by seeing what state their house is in, what they eat every day, and how they drown their sorrows every night. Especially later on as the town goes to seed, Dr. Brinkley’s Tower recalls Cormac McCarthy’s Blood Meridian, except better because as you know I didn’t really care for that book. The inhumanity and needless bloodshed that pops up out of nowhere is almost like the weather, and is very engaging to read about. The tower eventually begins to feel like a cancer on the community, and the book’s writing starts to reflect this, as weather patterns and refuse piles really give you the sense of a body in trouble. I would recommend this great Canadian book to almost everyone, there’s engaging characters, an excellent and evocative setting, and a fun story.